In 2018, Häagen-Dazs is returning to the All England Club as the Official Ice Cream of The Championships, Wimbledon, for the third year running. This year, in an inspired celebration of their ambassador Grigor Dimitrov’s favourite ice cream flavour, Cookies & Cream, the brand is challenging the classic champion Strawberries & Cream to an epic battle to find out which will be the No.1 flavour of the summer. The “Let’s Play” campaign, devised by Space, aims to highlight the fun, playful characteristics of both the brand and Dimitrov by introducing his favourite flavour, Cookies & Cream as the disruptive new challenger to the traditional favourite ‘’champion’’ Strawberries & Cream. To mark the collaboration, the brand is introducing Cookies & Cream, on a limited-edition stick bar designed by Grigor. This will be launched exclusively for Wimbledon to further drive buzz and rival Strawberries & Cream head-on for the duration to become the must-have accessory of The Championships. The campaign will be activated across a series of content films, placed through Facebook, YouTube and Instagram, as well as out of home and in-store across all major supermarkets. 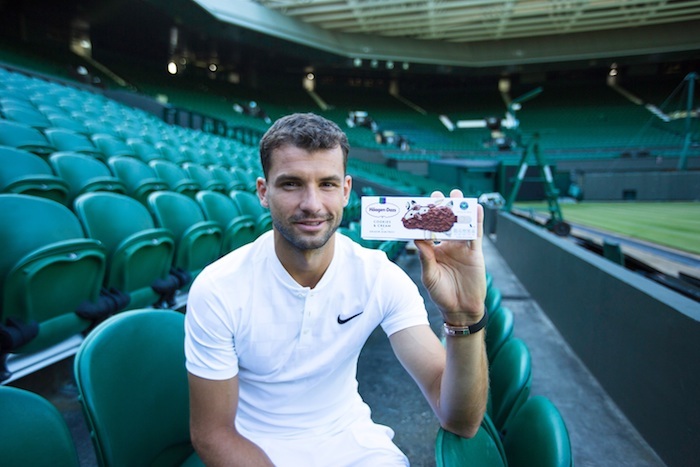 The ‘Champion vs Challenger’ campaign will also be brought to life on-site at the Häagen-Dazs parlour at The Championships with a face-off between Wimbledon’s favourite strawberries and cream-inspired ‘Champion’ recipe and Grigor’s favourite cookies and cream inspired ‘Challenger’ recipe. In the build-up to The Championships, Wimbledon, the brand will also be activating the ‘Champion vs Challenger’ series around LTA events, including The Queen’s Club featuring fan engagements with Grigor and the Women’s Tennis Association’s (WTA) Tennis On The Thames event at Bernie Spain Gardens on London’s Southbank, at the foot of the OXO Tower. Here, the brand will bring the #LetsPlay campaign creative to life for consumers in the form of a ‘Champion vs Challenger’ piñata game, in which consumers will be invited to participate, with free ice cream sampling happening all day on Thursday 28th June. Fans will also have the chance to challenge a secret women’s tennis star, who is a huge Häagen-Dazs fan and join in the flavour challenge. The campaign forms part of a £1million marketing investment, which includes out of home, TV, PR and social. Häagen-Dazs is the Official Ice Cream of The Championships, Wimbledon, and British Tennis. Cookies & Cream stick bars are available in single packs on-site at Wimbledon and via Amazon Fresh and Amazon Prime Now for an RRP of £2.29. Multipacks, containing three stick bars, are available in Tesco for an RRP of £3.89.